Today we introduced Winnie to Fort Fido. 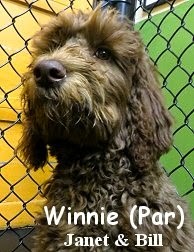 She is a good looking, high-energy, six month old, about thirty pound, chocolate colored, Labradoodle. Winnie was the perfect size, and had the right temperament, to try out our Medium Play Area. Inside the roll, she was ecstatic about getting to meet and greet with the other canines. After a couple of short "sniffs" with a few different pack members, Winnie, let out an awesome Play-bow, attempting to get Cody into play... And get Cody into play she did! The two Labradoodles became pals instantly, and had a blast together, sprinting around for a good part of the morning. Winnie continued to have a great time throughout her Assessment, fitting in with the group well and playing with any dog that was game. First-rate stuff Winnie, we look forward to your return! In theses clip, Winnie and Cody, just start to begin their morning's fun. Yesterday we had Reese in for her Assessment Day. 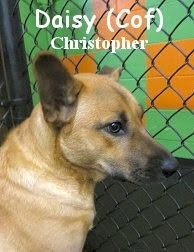 She is a two year old, forty-one pound, brindle, Pit Bull Terrier and Australian Cattle Dog Mix. Reese's first couple of years have been tough. Unfortunately, she was abused, and on top of that, just got done having a litter of puppies. It's been a roller coaster for her. Fortunately however, she has just been rescued and has found a loving forever-home with her new owner. 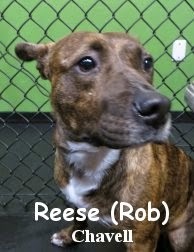 The great thing about Reese, is that although she's a bit timid around people at first, she is fantastic with other canines! 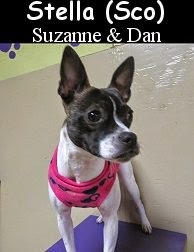 She speaks very good "Dog", and socializes with other canines most properly. Reese had a blast in The Fort's Big Roll, where she made several friends quickly and easily. It's cool to see such a resilient canine in action. In this clip, Reese and Tucker get into some shenanigans. Bright and early this morning we Assessed Shiva! She is a stunning, five month old, thirty pound, German Shepherd. Alert and excited, Shiva was quite ready to explore her new surroundings... It was also hilarious when she barked a bit before coming in, after noticing our "dog silhouettes" on the outside of the building. 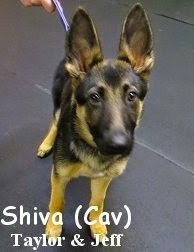 Your typical German Shepherd, Shiva, is good looking and highly intelligent, she will continue to need very strong leadership to grow into a calm and balanced adult dog. Due to her small size, Shiva hung-out in Fort Fido's Medium Roll. There, she met with the Medium Roll pack healthily. For a pup, she did a real fine job of meeting, greeting, and "speaking" with the elder-dogs. When it came to playing, Shiva was extremely into it! She "got down" with several of the Medium Rollers, and took quite a liking to Otis, among others. 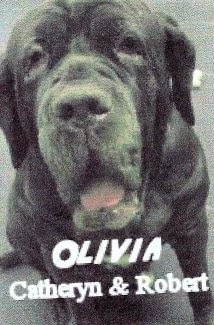 You can see, Shiva, playing with Otis, in the clips that follow. Reese and Shiva can both get a ton out of Dog Daycare. We are ecstatic to have them amongst our ranks! Yesterday we Assessed the lovely looking Beanie. 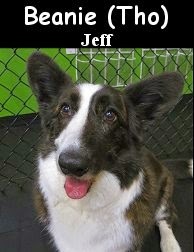 She is a outgoing, six year old, thirty pound, Cardigan Welsh Corgi. Beanie was ready and raring to go as she strutted through our lobby. This happy dog, has a whole lot of personality. We wasted no time and got her straight to our Medium Roll, where we knew she would fit in... And fit in she did! Although not the biggest "player", due to it being her first day, Beanie was very social. She met with each and every pack member quite amicably and enjoyed herself. Beanie was comfortable here, and we believe that she'll enjoy her time spent here even more in future visits. This morning, The Fort's Crew welcomed in Captain for his Assessment. He is a one year old, twenty pound, brown and black colored, French Bulldog. 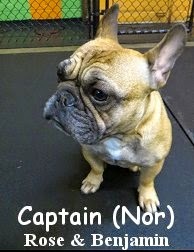 Frenchies may look "cute and innocent", but don't let them fool you lol, they pack a ton of energy and "big-dogness" into a small package... Captain, was no exception to this, hence why he hung out with us in our Medium Roll, where the high-energy is always flowing. Once inside the Play Area, Captain was in dog-playtime-heaven. He met quickly with Lucky, in a confident and correct canine-way. The two dogs then got into play, after their brief introduction, almost instantly! It was pretty hilarious to watch Captain rip around the roll with his goofy, yet highly efficient, gait. He can really move! Throughout the morning, Captain continued to amuse himself and get along with the pack. This tough little fella can get a lot out of Dog Daycare. Both Beanie and Captain may join us here at Fort Fido anytime. Way to go you two! This morning we met up with Daisy for her Assessment. She is a nice, seven month old, fifty pound, German Shepherd and Labrador Retriever Mix. We had Daisy try out our Medium Roll, where she really fit in comfortably. She first met Bingley whom welcomed her right in. After meeting Bingley, Daisy had a great time meeting and socializing with the other pups in the medium roll. She had a wonderful time just cruising around and enjoying herself here at The Fort. Daisy is welcome to return and play with her new-found friends in medium roll. This morning we had the pleasure of meeting Sir. 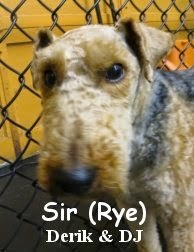 He is a 6 year old, 22 pound Welsh Terrier. He met the dogs in the medium roll, and had a great first day. Yesterday we met Frizzy's new brother Tater. 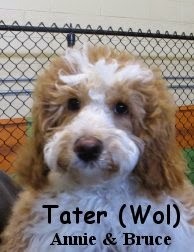 He is a 4 month old, 14 pound, White & Tan Australian Labradoodle. He had a great first day, and immediately started playing with the other dogs in the medium roll. Here is a clip of Tater playing with Abbie and Angel. 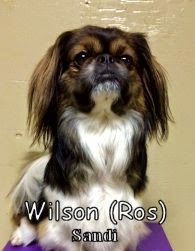 Wilson is a 1 year old, 15 pound, Maltese/Pekingese. He joined the small pack yesterday, and fit in nicely. In this clip he can be seen playing with Henry. In this first clip, Hank is having a great time playing with Nevada in the large roll. This next clip features Logan and Gatsby. Here is another clip of Nevada, this time she is playing with Espy the Chocolate Lab. Yesterday we had the kindly, Tucker, in for his Assessment. He is a one year old, seventy-two pound, Labrador Retriever and German Short-haired Pointer Mix. Recently acquired from an elderly couple, big-boy Tucker, has got a wonderful new forever-home, with great new owners that are willing and able to meet his needs. This lucky dude did quite well in The Fort's Big Roll. Inside the play area, he explored hastily, ready to get on with things, and meet some other canines. We introduced him to Jackson first, and the two dogs hit it off like gangbusters! 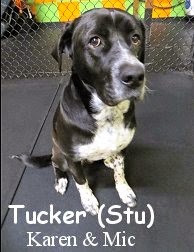 Throughout his stay, Tucker continued to do well, play, and stay social. 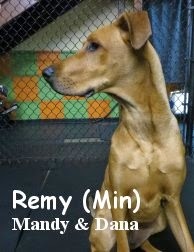 We believe he can extract much out of the Dog Daycare environment, and we hope to see him regularly. Great job Tucker! This morning we welcomed the elegant-looking Miss Maisy. 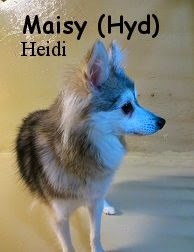 She is a one year old, twelve pound, Alaskan Klee Kai. Now this is a breed that Fort Fido Co-owner, Nancy (she's a huge Spitz Breed fan lol), and others, have been dying to get to know for years. It's awesome that we are finally getting the chance to. We had Maisy give our Little Roll a go, and once therein, she acted surprisingly calm and balanced while figuring out the place. Once the Small Dog Pack began to show up, Maisy greeted the members well, albeit a bit aloofly. Maisy didn't end up playing this morning, however, she really did a fine job of becoming part of the pack, and working out all of the personalities that it contains. Given time and consistency, we know Maisy can enjoy her time spent here even more. Good stuff. Yesterday the Fort Fido crew met Stella for her Assessment Day. She is a eleven month old, thirteen pound, brindle and white, Foxton. This fun mix of a dog, was ready and willing to give our Little Roll Play Area a go. Once inside, Stella, acted quite curious about her new digs, and she explored the Little Roll with confidence. When it was time to meet the pack, Stella did so gracefully. In no time at all, she was making friends and playing well with the other canines. She enjoyed Ball Time, and liked chasing around one of our Canine Hardware Kick Fetch Balls. Stella is the type of healthy canine that can get a lot out of Dog Daycare! Today we had Miss Maggie Rose in for her Assessment. 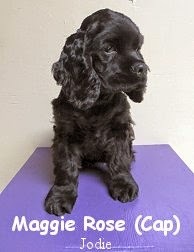 She is a sweet, five month old, about ten pound, American Cocker Spaniel. Maggie, is also the new "baby-sister" of Fort Regular, Thorn. Unlike her larger "brother" Thorn, Maggie, tried the Small Dog Play Area on for size. There, she was calm and content, while she explored the new area. As the morning moved on, and the Little Roll Pack began to arrive, Maggie happily met with each member, albeit cautiously. She is here to sharpen her social skills and burn-off some puppy energy. She has a lot to learn, but luckily, she's at the right place to do so, and her owners are doing a fine job of getting her on the right track too. In time, Maggie should certainly become a well rounded adult canine. Throughout the morning, Maggie played hard and socialized very energetically. She also enjoyed giving Little Roller, Dixie, a "run for her money" lol. We believe Maggie can't wait until her next visit and we plan on seeing her again soon. Just a few I've collected over the past couple of weeks, enjoy!